Every month, the Legacy Initiative makes approximately 900 bean and cheese burritos to feed our friends that are currently experiencing homelessness on the streets and shelters of Salt Lake City, Utah. Some people wonder why we do this, when there is a daily breakfast, lunch, and dinner served at St. Vincent’s on Rio Grande, and other soup kitchens in the downtown area. The food services that are offered are cafeteria based, and because of the amount of food served, is not very personal. The people wait in line, are given food on a tray, and are expected to eat quickly, and get back onto the streets as quickly as possible. The Legacy Initiative seeks to deliver food directly to the people in need, and do it with a sense of dignity and hope. We stop and listen to their stories, we get to know the people, we strive to help any way we can. We’ve had members bandage wounded feet, and literally give the shirt off their back to those who need it. A few months ago, our members wanted to do something different. We wanted to host a dinner event where people would be served like they were at a restaurant. 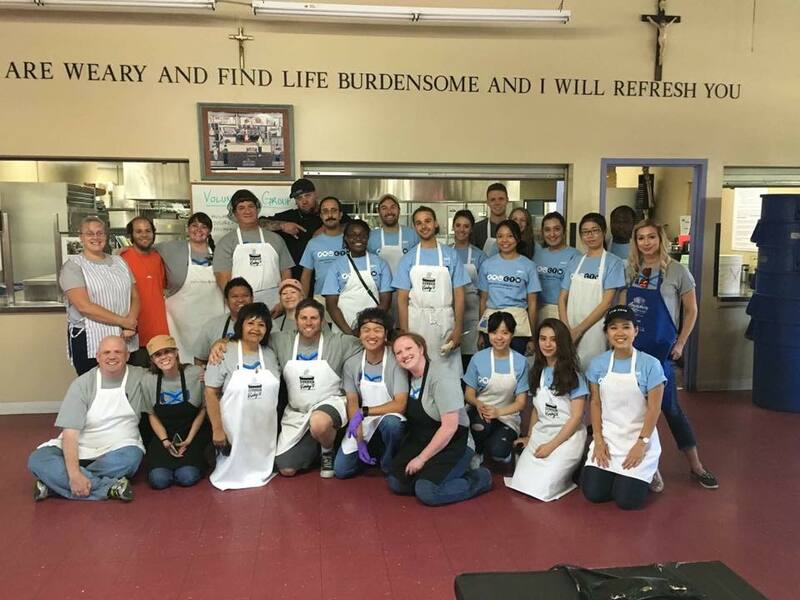 We partnered with Goldman Sachs and Catholic Community Services, and the first annual “Dining with Dignity” event was created. Planning a 3 course dinner with multiple options, including vegetarian, for 600+ people is no easy feat. We spent months planning a menu, pricing out options, signing up volunteers, finding entertainers, planning decorations, and more. We wanted to create an event to allow people to escape their difficult situations they face daily. The night before the event, several volunteers purchased and delivered 160 pounds of pasta, 100 pounds of sauce, 200 pounds of ground beef and chicken, 150 pounds of lettuce, 6 gallons of salad dressing, and 24 gallons of lemonade. This was used to create a salad course with an option of Italian or Ranch dressing, pasta with a meat sauce, chicken Alfredo, or pasta with just the cream sauce. Dessert consisted of a slice of cheesecake with strawberry topping, a cheesecake brownie, or a mini apple pie. Volunteers arrived at 1:00pm to begin to place table covers, centerpieces, setup the sound system for the entertainers, and to prepare the food for our guests. As 4:30pm approached, there was a line of our guests that went around the building and around the corner. We knew that the first rush would be crazy, but it’s still jarring when all your best laid plans go right out the window. The orders came fast and furious, and we quickly realized we had not assigned enough servers for the dinner. Some of our guests didn’t care what they ate, some wanted several servings, and some don’t communicate well. The service could have become pure chaos, but that’s the great thing about our volunteers, they put our guests first and focused on getting the people fed with dignity, grace, and a smile on their faces. As the first wave of guests were leaving and before the next group was admitted into the cafeteria, we quickly met and changed our strategy. We would now bring out trays of food with the different options, and that simplified and sped up the process tremendously. In between each course, I would walk the room and ask our guests how the food tasted, and how they were doing. So many people commented that the food was outstanding, and one elderly gentleman told me he couldn’t remember the last time he had tasted cheesecake. He wanted to savor each bite, and just relax and listen to the musical entertainment. I slipped him another piece and the grin on his face was priceless. Several people asked me who we were affiliated with, and why we were doing this event for them. I told them that we were volunteers that wanted to do something nice for our friends, and they had a hard time processing that. It made me sad that people would have trouble understanding why someone would want to do something nice for them. That’s part of the problem: the system doesn’t see them as people, it sees them as numbers. It sees them as a problem that needs to be hidden from public view, and pushed to the periphery. We were told that our guests would only be allowed one glass of punch, as that is the standard during the meal services. To give them more, would risk running out, or raise expectations for future meal services. We decided as a team that if we ran out of punch, we would switch to water, but every one of our guests could drink as much as they wanted. It was+ a 90 degree day, and who has a sit down dinner without drink refills? As the meal came to a close, many of guests wanted to linger and listen to the music, to talk to our volunteers, to just let this moment last a little bit longer. One woman thanked her husband for taking her out on such a nice date, several parents thanked me for the fresh salad they were able to feed their kids, and the fresh orange they got as they left. One gentleman told me that living on the streets quickly dehumanized him. He said living there quickly stole his hope, and he felt worthless and ignored. He thanked me for letting him feel like a human again, if only for a short while. He stuck out his hand, and I embraced him instead. He broke down sobbing, and thanked me over and over. I told him that the feeling was mutual and just hugged him tight. After all of our guests left, we helped package up the leftovers that the kitchen would serve another day, swept and mopped and sanitized the kitchen and dining room. We then gathered in the parking lot, exhausted and overwhelmed, and as is our custom, we burst into giggles. The volunteers of the Legacy Initiative aren’t just my friends, they are my family. They are my brothers and sisters, and we feed off each other’s energy. We took selfies, we shared stories of our experiences, and just sat in awe of the good work we had achieved. It wasn’t flawless, but it was perfect. We bonded together, we served those who needed us, we gained more than we gave, and we did it with love and dignity. The last service ended over an hour before, and some of the guests were walking by the gates of St. Vincent’s and yelled their thanks and gratitude. We stayed together in that parking lot for almost 30 minutes, just enjoying each other’s company, and people slowly started to give their goodbyes and head home. A small group of us decided to go to a bar up the street, get a drink and a little food, and I don’t think any of us wanted to let go of each other yet. We laughed until our sides hurt, and we left after the sun went down. We stood in the parking lot, and gave each other hugs goodbye, but we still found reason to linger. We just didn’t want to leave each other’s company. A young man approached us, almost in tears, and said that he needed $13 to get a bus ticket to get home to see his family. He told us how ashamed he was to ask for help, but he was desperate to get home. One of the founding members reached into his pocket and gave this man a $20 without hesitation. The man was overcome and wanted to know how he could repay the gift. Travis told him to find us on Facebook and message us when he got home so we knew he had arrived safely. The man asked how he could give back the extra $7 – and Travis told him to get some food, find a safe place to rest, and catch the bus in the morning. The man replied he hadn’t eaten anything in 4 days, and couldn’t believe how blessed he felt to have found us. He asked the best route to get back to the bus terminal and avoid any bad areas of town. Travis offered to take him to get food, and then take him directly to the terminal so he would be safe. This act of selflessness was the perfect way to end the day. Everyone deserves a meal. Everyone deserves to have their story heard. Everyone deserves to live with hope, with dignity, and feel loved. It was the hardest event that I have ever done with the Legacy Initiative, but I am so grateful for the opportunity to serve with those I love, and I’ll never forget it. Next week, we will have our volunteer appreciation dinner, and then the week after Salt Lake Comic Con comes our annual “Superheroes and Burritos” event, where we dress up in superhero costumes, and deliver the burritos to our friends on the streets. You are more than welcome to join us at this, or any Legacy Initiative event. Like us on Facebook and you’ll find the details on our next event. Serve with us and I promise you’ll change lives – starting with your own.